BROOKLYN – Midview became only the second Lorain County team ever to win a Baron Cup title of any kind and the first to win a Baron Cup III title when the Middies clubbed Cleveland Heights Sunday, 4-2, in the John M. Coyne Recreation Center. With only five varsity hockey teams in Lorain County, now is the team County residents should consider building a second and maybe third sheet of ice in the county so that programs like Midview could continue building its programs and so that the sport could blossom. Historically, Cleveland Heights is one of the strongest high school programs of all time. The Tigers won the state title in 1987 on this same ice after going 30-0 in 1986 before losing to St. Edward in the title game in Bowling Green. This should put things into perspective for the non-hockey fan. Midview (25-4-1) never trailed in this game. The Middies took a 1-0 lead when Austin Steindl scored an unassisted goal at 5:26 of the first period. Midview had a 2-0 lead at 8:13 of the opening stanza when Jason Pickering scored a goal with an assist coming from James DuBois. The shots were fairly even in the first period with Midview holding a slight 10-9 advantage. Hardly a strong power-play team this season, Midview did not capitalize on the man advantage until its third uneven skate when Dubois, who was named the MVP for the tourney, scored at 9:44 of the second period. A hooking penalty on the Tigers set up the DuBois tally that made it a 3-1 game. Heights had sliced the deficit in half with a power-play goal by Dom Szpak at 6:37. Ben Urbas and Tyler Rudy assisted on the Szpak goal while Steindl and Pickering assisted on the DuBois bell ringer. Dubois, Steindl and Pickering did not begin skating together as a line until late in the season when injuries began shaking up things for the Middies. For the game, the Middies wound up going one of five on the power play. DuBois scored an open-net goal late in the game. Jake Lyons and Pickering assisted. Aidan Hall for Heights and Blake Sunagel for Midview each had 23 saves in goal. St. Ignatius set a state record for most wins in a season by a hockey team with Sunday’s 2-0 win over Shaker Heights in the Baron Cup I championship game in Brooklyn’s John M. Coyne Recreation Center. The Wildcats move to 36-0 on the season with the win, demolishing the record of 35 wins set by Gilmour last season. After the Wildcats and Red Raiders played to 0-0 tie through two periods, Ignatius got the game winner from Paddy Spellacy at 6:13 of the third. It was the first Baron Cup title by the Cats in 20 years. Shaker has been Baron Cup champs 10 times and is the only program to go undefeated from beginning to end, doing so in 1980-81, under Mike Bartley, who is still the Shaker coach. Mike Abood scored an open-net goal in the waning seconds. BRISTOL, TENN.  Sophomore Zak Vargo (Stow, Ohio/Cuyahoga Valley Christian Academy) ran his consecutive win streak to nine straight and freshman Ian Ross (Newark, N.Y./Newark) won both his matches as the Lake Erie College wrestling team split a pair of matches in a tri-match with Ohio Valley University and host King College. The Storm easily handled Ohio Valley 41-3, winning all but the final match, but came up just short to 16th-ranked King, 23-10 in a contest that featured four matches decided by two points or less. Against OVU, Lake Erie led at one point 41-0. After a forfeit for Justin Toth (Painesville, Ohio/Riverside/Mt. Union) at 125 pounds to open the day, Ross and sophomore Kevin Brunner (Avon Lake, Ohio/Avon Lake) picked up decisions at 133 and 141 pounds, respectively. Vargo pinned Timothy Parsons midway through the second period at 149 pounds and freshman Nate Ball (Wadsworth, Ohio/Wadsworth) followed with a major decidision at 157 pounds. Freshman Dylan Zivcic (Mentor, Ohio/Mentor/Lakeland) earned a forfeit at 165 pounds and freshman Matt Vandermeer (Clarkston, Mich./Clarkston), wrestling at 174 pounds for the first time this season, earned a 15-0 technical fall over Justin Smith. Classmate Jon Schafer (Cleveland, Ohio/St. Peter Chanel) followed with a tech fall of his own at 184 pounds and redshirt freshman Mikey Samijlenko (Parma, Ohio/Normandy) earned the Storms final win at 197 pounds with a 4-2 decision. Ross picked up a 5-1 decision against Cullen King, Vargo had a major decision win over Nic Stella and sophomore Josh Linden (Broadview Heights, Ohio/Brecksville-Broadview Heights) won convincingly at 184 pounds in the matchup of two of the top six ranked teams in Region 2. However, the Tornado won five of the last six bouts to break open a close dual. Three of those matches came down to the final seconds and were decided by just a pair of points in two of them and the other was a 3-2 win by Frank Morgan over Samijlenko at 197 pounds. The Storms (8-11) dual meet season is now complete. Lake Erie will be off until the NCAA NCAA Division II Region 2 tournament Feb. 25-26 in Edmond, Okla.
BEREA, OHIO – The Baldwin-Wallace College men’s tennis team defeated Penn State Behrend University, 9-0, today (Saturday, February 11, 2012) at the Paramount Tennis Club in Medina. This was the first winter-spring match for the Yellow Jackets. B-W also plays another match tonight when it faces Thiel College of Pennsylvania at 6:30 p.m. at the North Ridge Racquet Club in North Ridgeville. The Yellow Jackets gained a 3-0 advantage in doubles. The number one duo of seniors number one singles player Alex Trzeciak (Avon Lake) and No. 5 player Alexandre Bourdiaux (FRANCE) won 8-3, the No.2 tandem of junior No.2 player Joe Horvath (North Royalton) and Tyler Beaton (Bemus Point, N.Y./Maple Grove) won 8-1 and the No.3 duo of sophomore Brad Minrovic (Akron/Ellet) and senior Taylor Long (Ashland/ Senior) won by an 8-1 shutout. In singles play, B-W again dominated as Trzeciak won at No. 1 by the scores of 3-6, 7-5, and 10-5, Horvath won at No. 2 by the scores of 6-0 and 6-3, Kearney won at No. 3 by the scores of 6-0 and 6-1, freshman Kyle Patterson (Wooster/Triway) won at No. 4 by the scores of 6-0 and 6-1, senior No. 5 player Bourdiaux won by the scores of 6-1 and 6-1 and Josh Pecinovsky (Columbus/Bishop Hartley) won at No. 6 by the scores of 7-6 (7-5), 3-6, and 10-5. WESTERVILLE, Ohio -- Four different records were set by the Mount Union women's indoor track and field team as the Purple Raiders claimed first place at the All-Ohio Championships Saturday at Otterbein Universityin Westerville. Junior Mary Mahoney (Ashtabula/St. John-St. Paul) was part of three Mount Union records as she bested her own marks with first place finishes in the 200 meters (25.45) and 400 meters (56.51) then joined up with teammates in sophomores Taylor Ruffing (Attica/Seneca East), Lisa Brasdovich (Columbia Station/Columbia) and Taylor Kring (Salem/West Branch) to set a new school record with a win in the 4x200 meter relay (1:44.38). Sophomore Emily Mazzaferri (Canton/GlenOak) set a an All-Ohio Championship record with a first place finish in the 800 meters (2:15.31). Kring also won the 60 meter hurdles with a time of 8.98. The other top Mount Union performances came in a third place finish in the shot put by senior Aubree Jones(Falconer, N.Y./Falconer) (40-7) and a fourth place finish in the mile by freshman Brooke Benner(Orrville/Orrville) (5:17.53). WESTERVILLE, Ohio -- Mount Union's men's indoor track and field team placed fourth at the All-Ohio Championships Saturday at Otterbein University in Westerville, Ohio. Senior Sean Denard (Naperville, Ill./Naperville North) won the shot put with a season-best and a provisional mark for the NCAA Championships with a throw of 54-4. Sophomore Sam Ludgood (Webster, N.Y./Webster Schroeder) placed second in the long jump (21-11) and fourth in the triple jump (43-11.75) while fellow sophomore Levi Simmons (Uniontown/Lake) placed second in the high jump (6-4.75). Another second place finish came from the 4x400 meter relay team of sophomores Derick Schwedt (Brook Park/Berea) and Alex Kovalik (Aurora/Aurora), freshman Tyler Mettille (Canfield/Canfield) and junior Melvin Woodard (Zionsville, Ind./Zionsville) (3:25.25). Rounding out the top performances were a fourth place finish by freshman Dustin Matak (Salem/Salem) in the 60 meter dash (7:07) and senior Chase Clark (Belmont/Union Local) was fifth in the pole vault (14-7.25). Sophomore Julian Milinkovskyi (Ukranie) placed first in the 200 Yard IM to win the first Lake Erie College Individual GLIAC Swimming Title in the program's season season, highlighting the Storm effort at the four-day 2012 GLIAC Championships which concluded Saturday (Feb. 11). Milinkovskyi swam the 200 Yard IM in 1:48.79 which is an NCAA "A" Cut time. That means Milinkovskyi will be joining freshman Ivan Cizmar (Zagreb, Croatia/) at next month's NCAA Division II National Championship in Mansfield, Tx. Milinkovskyi also placed second in the 200 Yard breaststroke in 2:00.88 after qualifying with the top time of 2:01.80. He finished just .08 behind the champion and just .16 off the NCAA "A" cut time in the event. He also earned All-GLIAC in the 400 Yard IM, placing third with a personal-best time of 4:00.73. Cizmar had a successful championship as well. Cizmar earned All-GLIAC by placing third in the 200 Yard backstroke with a time of 1:48.76. Cizmar also made the A Finals in the 400 Yard IM and 100 Yard backstroke, finishing fifth and seventh respectively with times of 4:02.20 and 51.54. Milinkovskyi and Cizmar were also part of two fourth place relay teams as they combined with freshmen David Thieshen (Bethal Park, Pa./Bethel Park) and Cole Leonberg (Freedom, Pa./Freedom) to swim the 200 Yard medley relay in 1:36.05 and the 400 Yard medley relay in 3:28.67. The Lake Erie women's effort was led by sophomore Lauren Menicucci (Reno, Nev/Reno). Menicucci jumped five spots from her seed position to qualify for the A final in the 400 yard IM, breking her personal-best time by over three seconds to take the eighth and final qualifying spot by .35 seconds in 4:41.61. Menicucci then finished eighth in the finals in 4:44.20. She also scored points in the 200 Yard IM with a 13th place finish in 2:12.08 and the 200 Yard Breaststroke finishing 15th in 2:29.47. Sophomore Casey Wendall (Lafayette, Ind./McCutcheon) took a similar route to an eighth place finish in the 200 Yard butterfly in 2:12.65. Wendall shaved nearly five second off her previous best time in the event to qualify for the A final with a race of 2:10.52, which jumped her six spots from her pre-meet ranking. See below for day-by-day highlights from all the Storm swimmers. Sophomore Julian Milinkovskyi (Ukraine) took the top seed in qualifying in the 200 Yard Breaststroke in a time of 2:01.80, cutting his previous-best time in the event by over two seconds. Milinkovskyi then placed second in the finals for his third All-GLIAC performance of the weekend with a time of 2:00.88. He finished just .08 behind the champion and just .16 off the NCAA "A" cut time in the event. Sophomore Lauren Menicucci (Reno, Nev/Reno) made the "B" final in the 200 Yard Breaststroke in a time of 2:27.96. She finsihed 15th in the finals in 2:29.47. Freshmen David Thieshen (Bethal Park, Pa./Bethel Park) and Cole Leonberg (Freedom, Pa./Freedom) each qualified for the B final in Saturday night's 200-yard butterfly with personal-best times of 2:01.96 and 2:08.42. They placed 13th an 15th in the finals respectively with further personal-best times of 1:58.56 and 2:05.46. Milinkovskyi finished third in the 400 Yard IM with a personal-best time of 4:00.73 and was followed by Cizmar who took fifth in 4:02.20. Milinkovskyi qualified third in with a time of 4:03.12 with Cizmar coming right behind him in fourth place at 4:03.31. Menicucci jumped five spots from her seed position to qualify for the A final in the 400 yard IM, breking her personal-best time by over three seconds to take the eighth and final qualifying spot by .35 seconds in 4:41.61. Menicucci also finished eighth in the finals in 4:44.20. Cizmar also qualified for the A final in the 100 Yard Backstroke in 51.45 and took seventh in the final in 51.54. Thieshen and Leonberg each swam personal-bests in the 100 Yard Butterfly to qualify for the B final in 13th and 15th position respectively with times of 52.61 and 53.53. Leonberg improved on that time in the finals finishing 14th in 53.29 while Thieshen came in 15th in 54.41. Julian Milinkovskyi won the GLIAC Championship in the 200 Yard IM, becoming the first Lake Erie College swimmer to win a GLIAC title. Milinkovskyi did so in a GLIAC Championship record breaking time of 1:48.79. He broke his own record in the final which he set earlier in the day with a NCAA "A" Cut qualifying time of 1:49.79. That time gave him the top seed for the finals and earned him a trip to the NCAA Division II National Championship in March. Lauren Menicucci finished 13th in the 200 Yard IM finals with a time of 2:12.43. Earlier in the day, Menicucci earned a spot in the final with a personal-best qualifying time of 2:12.08. The Lake Erie men's 400 Yard medley relay matched its fourth place finish in the 200 Yard medley relay a day earlier with a time of 3:28.67. In the 1000 Yard freestyle sophomore Casey Wendall (Lafayette, Ind./McCutcheon) bested her seed time by over 15 seconds, finishing 26th while senior Chelsea Giesen (Grand Pass, Ore./North Valley) finished 29th, besting her seed time by 22 seconds. Nicky Buckel set a personal-best in the 1000 Yard freestyle by 28 seconds, finishing 17th. Lake Erie's 200 Yard men's medley relay jumped one spot in seeding finishing fourth in the finals with a season-best time of 1:36.05, good for fourth place. WESTERVILLE, Ohio – The Case Western Reserve University women's track & field team placed seventh of 19 squads competing at the 2012 Division III All-Ohio Championship on Saturday at Clements Recreation Center on the campus of Otterbein University. Freshman Kristen Ruckstuhl<http://athletics.case.edu/sports/wtrack/2011-12/bios/ruckstuhl%20kristen%200yer> (Mentor, Ohio / Mentor) was runner-up in the 5,000-meter run in 18:29.65. Junior Leslie Stanard<http://athletics.case.edu/sports/wtrack/2011-12/bios/stanard%20leslie%20yrge> (Maple Heights, Ohio / Maple Heights) and senior Samantha Friedman<http://athletics.case.edu/sports/wtrack/2011-12/bios/friedman%20samantha%20xeq1> (Beachwood, Ohio / Beachwood) placed fourth and sixth, respectively, in the 60-meter dash with times of 8.24 and 8.30 seconds. Friedman also took eighth in the 200m dash in 27.23. Freshman Sophia Herzog<http://athletics.case.edu/sports/wtrack/2011-12/bios/herzog%20sophia%20rdj0> (Coopersburg, Pa. / Southern Lehigh) finished seventh in the pole vault with a height of 10 feet, six and one-quarter inches. Freshman Keri Walter<http://athletics.case.edu/sports/wtrack/2011-12/bios/walter%20keri%203o9p> (Cairo, Egypt / Cairo American) took sixth in the triple jump at 33'7.25," while junior Jenna Pansky<http://athletics.case.edu/sports/wtrack/2011-12/bios/pansky%20jenna%206k0s> (Parma, Ohio / Beaumont) placed seventh at 33'6." Senior Amanda Kline<http://athletics.case.edu/sports/wtrack/2011-12/bios/kline%20amanda%20lb8v> (Lancaster, Ohio / Lancaster) was sixth in the shot put at 38'5" and seventh in the weight throw at 46'4.75." The Spartans are back in action next Friday, February 17 at the Greater Cleveland College Championship hosted by Baldwin-Wallace College at 5:00 p.m. in Berea. BROOKLYN -- With Amherst repeating as Baron Cup II champions via Sunday’s 4-3 win over Solon, now is a good time to make an argument for the building of a second ice rink in Lorain County. Hockey has now come full circle in the county with both Midview and Amherst winning Baron Cup titles this season, increasing the number of Baron Cup titles won by Lorain County teams by 200 percent over the entire 40-year history of the tournaments. Four different boys scored goals to charge the “green Comets’” victory over “blue Comets” from the extreme southeast corner of Cuyahoga County. While Amherst repeated as Baron Cup titlists, Solon cannot hang its head low as it made a gallant comeback late that just fell short. In the meantime, Amherst will remain in the White Division even though it has now won the division’s tournament two consecutive seasons. The logic is simple, with not enough sheets of ice in the county, not enough youth become interested at a young enough age to create a large player pool by high school, leaving only two lines to skate, which is not enough to compete in the Red Division. Connor Morris, Dakota Dill, Austin Reid and Caleb Gannelli scored the Amherst goals. Amherst (29-2) took a 1-0 lead when Morris scored a goal with assists coming from Kevin Burgett and Reid. Morris is the school’s all-time leading scorer and already has 120 points this season. Burgett was named the MVP of the tournament. Solon, which was outshot by Amherst 50-10 in the regular season meeting won by the Lorain Countians, 1-0, finally found the back of the net of the Comet counterparts when it tied it 1`-1 at 9:14 of the first period on a goal by Sam Littman. Jake Pierce and Mike Krenn assisted on the Littman goal for the Comets, which go into the state tourney at 19-6-1. Amherst went ahead for good when Dill came around the right of Solon goalie Kyle Peterson and scored on the wraparound, making it 2-1 at the 11:13 mark of the second period. John Reid and Dave Bartizal assisted on the Dill lamplighter. Before the inaugural period would be completed the special teams would come through for the two-time Baron Cup champions. After a tripping penalty on Solon, Gannelli took a pass in front of the blue line and slapped home a goal at 13:37, making it 3-1. Morris assisted on the Gannelli goal. Austin Reid made it 4-1 at 1:53 of the second period with an assist from Morris. Solon had two power-play opportunities later in the second period but could not capitalize. Eric Pohle made it two-goal game for Solon with a goal at 6:43 of the third and John Hannah a one-goal game at 9:01 but it was too little too late. Spencer Wien and Hannah picked up the third-period assists for Solon. Westlake, Ohio – Oberlin College sophomore Molly Martorella was named as the North Coast Athletic Conference Female Distance Runner of the Week, the league office announced on Sunday afternoon. Martorella received the honor for her record-setting run at the Boston University Valentine Invitational on Friday night. The Winchendon, Massachusetts, native posted the fourth fastest time in the country in the mile at 4:56.73. Martorella is the first female in school history to run a sub-five-minute mile. Her new school-record time bested that of Nicky Ouellet, who previously held the standard at 5:01.19. Martorella and the rest of her teammates will be in action on Friday night at the Greater Cleveland Championships on the campus of Baldwin-Wallace College. CHICAGO, Ill. - Senior forward Erin Hollinger<http://athletics.case.edu/sports/wbkb/2011-12/bios/hollinger%20erin%20927u> (Chardon, Ohio/Chardon) recorded a game-high 17 points, but No. 2 nationally-ranked University of Chicago (Ill.) outscored the Case Western Reserve University women's basketball team 50-26 in the second half en route to a 73-44 victory during University Athletic Association play on Sunday inside the Ratner Athletics Center. With the loss, the Spartans dip to 12-10 overall and 5-6 in the UAA, while Chicago remains undefeated improving to 22-0 and 11-0 in league play. Chicago jumped out early with the initial four points in a low-scoring first half. The Spartans responded by tying the game at 9-9 at the midway point of the period following a layup from senior forward Chelsea Peck<http://athletics.case.edu/sports/wbkb/2011-12/bios/peck%20chelsea%20dkys> (Pittsburgh, Pa./Oakland Catholic). Over the next five minutes, Chicago rattled off an 8-2 run making it 17-11, but the Spartans sliced that lead to three on a three-pointer by junior point guard Erica Iafelice<http://athletics.case.edu/sports/wbkb/2011-12/bios/iafelice%20erica%20psuy> (North Canton, Ohio/Canton Hoover) at 2:19. The Maroons then finished the half on a 6-4 run to lead 23-18 at the break. Out of halftime, the Maroons tallied 12 of the first 15 points moving their lead to 14 (35-21) with a Taylor Simpson layup at 15:42. The hosts continued to apply pressure increasing the advantage to 22 (58-36) with 4:12 remaining on a layup from Hannah Ballard. The Spartans were unable to find a rythmn on the offensive side, and Chicago cruised to the 29-point win. For the game, the Spartans connected on just 16-of-47 (34 percent) attempts from the field, including 9-of-25 in the second half and 2-of-17 from beyond the arc. In addition to Hollinger's 17 points, Iafelice, freshman guard Brooke Orcutt<http://athletics.case.edu/sports/wbkb/2011-12/bios/orcutt%20brooke%20bsso> (Morrison, Colo./Dakota Ridge) and Peck each chipped in with six for Case. Simpson led the Maroons with 12 points along with a game-high nine rebounds, while Torres and Morgan Herrick each chipped in with nine markers. As a team, Chicago held a 42-25 advantage on the glass and connected on 8-of-17 (47.1%) from beyond the arc. 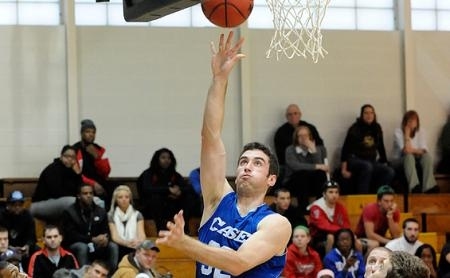 CHICAGO, Ill. – Case Western Reserve University men's basketball senior forward Tom Summers<http://athletics.case.edu/sports/mbkb/2011-12/bios/summer%20tom%206z6i> (Murrysville, Pa./Franklin Regional) scored a team-high 21 points, but it wasn't enough as the University of Chicago (Ill.) slowly pulled away in the second half lifting the hosts to an 86-78 victory on Sunday afternoon during University Athletic Association play inside the Ratner Athletic Center. With his 21-point showing, Summers inches closer to the 1,000-point plateau with 990 for his career. With the setback, the Spartans slip to 9-13 overall and 1-10 in the UAA. The Maroons pick up their second victory of the weekend improving to 13-9 and 6-5 in the Association. With the score knotted at 7-7 at the 16:05 mark of the first half, the Spartans embarked on an 11-3 run over the next five minutes which included six points from freshman guard Julien Person<http://athletics.case.edu/sports/mbkb/2011-12/bios/person%20julien%20jc1d> (Houston, Texas/Second Baptist). The final basket of the run gave Case its largest lead, at 18-10, as Summers followed an offensive rebound with a put-back. However, Chicago slowly chipped away at the lead, eventually grabbing a one-point edge (26-25) as a lay-up by Matt Johnson closed a 16-7 run with 4:44 left in the opening period. The teams traded buckets over the next few minutes before Summers tallied a lay-up on an assist from freshman point guard Jordan Dean<http://athletics.case.edu/sports/mbkb/2011-12/bios/dean%20jordan%20t9at> (St. Johns, Fla./Creekside) and freshman Dane McLoughlin<http://athletics.case.edu/sports/mbkb/2011-12/bios/mcloughlin%20dane%20310f> (Westerville, Ohio/St. Charles Preparatory) snagged his own missed three-point attempt and hit a twisting jumper in the lane giving the visitors a 34-30 edge. Chicago's Charlie Hughes then connected on a three-pointer just seconds before the half cutting the Spartan halftime advantage to just one, 34-33. Out of the break, the Spartans rattled off a 9-4 spurt finished off with a jumper from junior forward Austin Fowler<http://athletics.case.edu/sports/mbkb/2011-12/bios/fowler%20austin%207uzw> (Farmington Hills, Mich./Birmingham Brother Rice), giving the visitors a 43-37 lead with 16:25 left to play. But similar to the first half, the Maroons answered with a quick 6-0 spurt in less than a minute of action, tying the contest at 43-43 as Matt Johnson completed a three-point play. Over the next several minutes, Chicago slowly built an advantage between three and seven points before eventually moving ahead by 10 (70-60) with 4:33 left on a three-pointer by Sam Gage. The Spartans would get no closer than six the rest of the way. Individually, Summers' 21 points were accompanied by eight rebounds giving him 702 boards for his career. Fowler finished with his second double-double of the weekend and sixth this season with 15 points and 11 rebounds, while sophomore center David Thompson<http://athletics.case.edu/sports/mbkb/2011-12/bios/thompson%20david%206iaw> (Plano, Texas/Plano Senior) and Dean chipped in with 12 and 10 points, respectively. BEREA, OHIO -- The Baldwin-Wallace College men’s tennis team opened its 2012 winter/ spring season today (Saturday, February 11) by shutting out both Penn State Behrend (Pa.) University, 9-0, this morning at the Paramount Racquet Club in Medina and Thiel College of Pennsylvania, 9-0, this evening at the North Ridge Racquet Club in North Ridgeville. With its victories, B-W improved to 4-0 overall when combining its 2-0 fall 2011 record while Penn State Behrend dropped to 1-3 overall and Thiel dropped to 1-4 overall. Against Thiel in singles play, B-W dominated winning all the six matches. Senior number one singles player Alex Trzeciak (Avon Lake) won by the scores of 6-2 and 6-3, junior No.2 player Tyler Beaton (Bemus Point, N.Y./ Maple Grove) won by the scores of 6-1 and 6-0, sophomore No.3 player Brad Minrovic (Akron/ Ellet) won by the scores of 6-0 and 6-0, senior No.4 player Taylor Long (Ashland/ Senior) won by the scores of 6-0 and 7-6 (9-7 in the tie-breaker), freshman No.5 player Andreas Reichert (New Philadelphia/ Claymont) won by the scores of 6-1 and 6-0, and freshman No.6 player Zach Elbin (Findlay/ Senior) won by the scores of 6-2 and 6-0. Against Thiel in doubles play, B-W won all three matches by identical 8-4 scores. The No.1 duo of freshman Kyle Patterson (Wooster/ Triway) and Long, No. 2 duo of sophomore Josh Pecinovsky (Columbus/ Buishop Hartley) and Minrovic and the No.3 tandem of Reichert and Elbin were triumphant. With the win, the Terriers improve to 8-15 overall and 5-10 in the NCAC. The Bishops are now 9-14 overall and 5-9 NCAC. Both teams started out slow in the first half, but the opening period did feature five ties and six lead changes. Hiram led by four points, 14-10, just under the midway point of the half thanks to a three-pointer by freshman guard Larissa Davis (Cleveland Heights). OWU responded with a 7-0 scoring run that put the Bishops up 17-14 with 7:31 left before halftime. The Terriers regained control with a mini 6-0 run of their own to make the score 20-17 at the 5:25 mark. But momentum swung back in favor of the Bishops to end the half thanks to a 14-0 run that gave OWU a comfortable 31-20 margin with 1:27 left before the break. Hiram stopped the bleeding with four straight points, all from Davis, to end the scoring, but the Terriers still trailed 31-24 at the intermission. The Hiram shooting picked up in the second half as the Terriers shot 44.8 percent (13-of-29) and held OWU to just 21.9 percent shooting (seven-of-32) in the final 20 minutes. The Bishops led by as many as seven points early in the period, but Hiram began to make its run and later evened the score at 43-43 on a jumper by senior guard Tiffany Shields (Bedford Heights/Bedford) with 9:17 remaining in the game. The Terriers eventually took the lead but OWU would come back to take a one-point advantage, 50-49, at the 4:12 mark. Hiram took the lead for good with an ensuing 8-0 run that was sparked by a three-pointer by sophomore guard Marisa Thomas (Lorain/Amherst) which later led to a 57-50 margin for the Terriers with 2:17 to go. OWU made the game interesting down the stretch, pulling to within two points, 60-58, with just 10 seconds left. A pair of critical free-throws by junior guard Chelsea Kovach (Lakewood) ended up sealing the victory for the Terriers as Hiram held on for a 62-58 come-from-behind win. The OWU offense was led by the combination of Tamra Londot and LaNiece McRae who both scored 11 points. Both also had big games on the glass with Londot recording nine rebounds and McRae posting a game-high 16 boards. Julia Grimsley was the only other Bishop player in double-figures with 10 points. The Terriers were led by Shields with a game-high 12 points on five-of-15 shooting (33.3 percent) to go along with six rebounds. Thomas also scored in double-digits with 10 points. In addition, junior guard/forward Amy Geisman (Middleburg Heights/Midpark) grabbed a team-high eight rebounds. Hiram will host Ursuline College on Wednesday, Feb. 15 in the regular-season home finale at Price Gym. It will be senior night and will also be part of a basketball doubleheader with the Terrier men’s team. The women will take on the Arrows at 6 p.m., followed by the men against Oberlin College at 8 p.m.
WESTERVILLE, OHIO – The Baldwin-Wallace College men’s indoor track and field team finished third and the women third at the 2012 All-Ohio Division III Championship Meet today (Saturday, February 11) inside the Clements Recreation Center at Otterbein University. The Yellow Jacket men scored 71 points and placed 3rd of 18 schools and the women scored 65.5 points and placed 3rd of 19 teams. Fans and media can get live results of the meet at http://onthemarktiming.com/past_results/results.2012/allohioIN12/. Leading the way for the men was sophomore multi-event athlete Brandon Eddy (Cuyahoga Heights) who finished first in both the pole vault and the high jump with heights of 15’ 1’’ and 6’ 6.75’’ respectively scoring 20 points for the Yellow Jackets. Junior thrower Mitch Supan (Medina/Walsh Jesuit) placed second in the weight throw with a distance of 55 feet 3.5 inches. In addition to Eddy for the men, the distance medley team consisting of senior Tom Wilkin (Powell/Olentangy Liberty), Dan Sloat (Medina), Issac Baker (Lithia, Fla, /Newsome), and Drew Beck (Canandaigua, N.Y./Canandaigua Academy) finished third with a time of 10:34.04. Junior star distance runner Ken Janosko (Mentor) finished second in the 5000 meter run with a time of 15:06.60 to score 8 points for B-W.
For the women, Christina Perrine (Middleburg Heights/Midpark) and Leslie Purnell (Springfield /Catholic Central) went first and second in shot put and weight throw. Perrine and Purnell had distances of with a distances of 42 feet 4.75 inches and 41 feet 4.25 inches respectively in shot put. Perrine and Purnell threw 54 feet 8.75 inches and 53 feet 10.5 inches respectively in the weight throw. In the Distance Medley relay, the team of junior Tess Hoogeveen (Westerville/South), senior Julie Kotesovec (Litchfield/Medina Buckeye), Sophomore Brooke Hradisky (Aurora), and Sophomore Jamie Clapacs (Willoughby Hills/South) placed third with a time of 12:50.45. In addition, sophomore Nicole Smith (Geneva) placed third in the 400 meter dash crossing the finish line at 1:00.38. In the 4x400 Meter Relay, the team of Smith, junior Brittany Sterling (Lima), Hradisky, and Clapacs finished in a time of 4:09.97 which was good enough for third place. WESTERVILLE, Ohio – The Case Western Reserve University men's track & field team placed 14th of 18 squads competing at the Division III All-Ohio Championship at Clements Recreation Center on the campus of Otterbein University. Senior Matthew Jurcak<http://athletics.case.edu/sports/mtrack/2011-12/bios/jurcak%20matthew%20a088> (Olmsted Falls, Ohio/Olmsted Falls) finished runner-up in the 60-meter hurdles with a season-best time of 8.21 seconds. Junior Cameron Lee<http://athletics.case.edu/sports/mtrack/2011-12/bios/lee%20cameron%20a7me> (New Brighton, Minn./Irondale) took sixth in the triple jump with a mark of 41 feet, 10 and one-half inches. Senior Eben Via<http://athletics.case.edu/sports/mtrack/2011-12/bios/via%20eben%20kmam> (Evanston, Ill./Taylor Allderdice, Pa.) and sophomore Harry Weintraub<http://athletics.case.edu/sports/mtrack/2011-12/bios/weintraub%20harry%20kqgd> (Croton-on-Hudson, N.Y./Hendrick Hudson) placed seventh and eighth, respectively, in the weight throw with distances of 49'7.25" and 49'0.75"
GAMBIER, Ohio – The No. 19 Case Western Reserve University men's tennis team played its second-straight nationally-ranked opponent to open the spring, and for the second day in a row, the Spartans were on the short end of the scoreboard, falling 7-2 to No. 12 North Carolina Wesleyan University on Saturday afternoon at the Kenyon College Athletic Center. The Spartans (2-2 overall) return to action with three matches next weekend, beginning at Division I University of Toledo on Friday, February 17 at 1:00 p.m.
Case led 2-1 after doubles competition with wins at the first and second positions. Sophomore John Healey<http://athletics.case.edu/sports/mten/2011-12/bios/healey%20john%20d4pz> (Columbia, Md./Atholton) and junior Kyle Gerber<http://athletics.case.edu/sports/mten/2011-12/bios/gerber%20kyle%20tl2z> (Columbus, Ohio/St. Charles Prep) teamed up for an 8-5 win at No. 1 versus Robert Kjellberg and Alexey Rumyantsev. Junior Richard Brunsting<http://athletics.case.edu/sports/mten/2011-12/bios/brunsting%20richard%20odi2> (Nashville, Tenn./Montgomery Bell Academy) and senior Sean Carr<http://athletics.case.edu/sports/mten/2011-12/bios/carr%20sean%201zfu> (Columbus, Ohio/Upper Arlington) then followed with an 8-2 victory at No. 2 over Viktor Selander and Rinat Khussainov. From there, it was all NCW, as the Battling Bishops won all six singles matches in straight-sets to improve to 1-0 in dual matches. Following next Friday's match at Toledo, the Spartans play later that day versus Division II Ferris State University (Mich.) at 6:00 p.m. at Perrysburg Tennis Center.